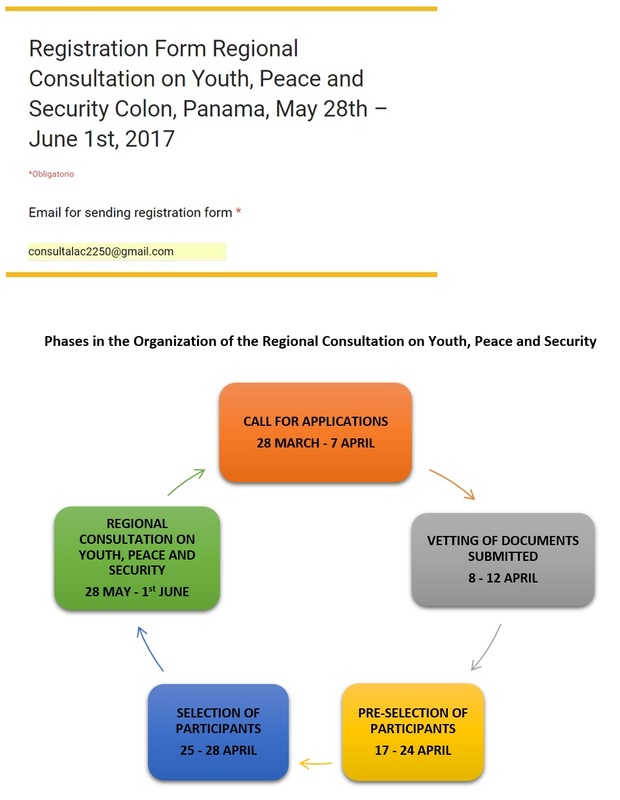 From 29 May to the 1st of June 2017, the “Regional Consultation on Youth, Peace and Security: Voices of youth in Latin America and the Caribbean” will be held in Panamá, where the contributions of young people in preventing violence and conflict and promoting and strengthening of peace will be discussed and analysed. This event would not be possible without the collaboration and exchange amongst the following organizations: OAS, UNDP, UNESCO, UNFPA, UNHCR, UN Peacebuilding Support Office, UN Volunteers and UN Women. On this page you will find more information on the main requirements to participate in this call for applications, the documentation that must be provided, the criteria for evaluating applications and the link to the registration form. Young people interested in participating can complete the registration form until the 7th of April 2017. Once the form is completed, you can send your response to the following email address: consultalac2250@gmail.com, as shown in the image below. Remember to attach your resume / CV and your statement of motivation and send all these documents to this same email address. If you have any questions, please write to us at the mentioned email. >> Youth between 18 and 29 years old; as explicitly stated in Security Council Resolution 2250. Promotion, awareness-building and defence of human rights. Social cohesion and social fabric recovery. Local and national governance processes. Activism through civil society: Advocacy. Prevention of youth violence: gangs. Reconciliation and access to justice. Gender violence, especially sexual violence. Promotion, awareness-building and defence of human rights, with emphasis on sexual and reproductive rights. The Organizing Committee of the Consultation will cover the cost of international travel, accommodation and daily subsistence for 70 participants. It will guarantee equal opportunity to participants regardless of their status or origin, and will always seek the balanced representation of all countries in the region. In this sense, it will advocate for an equitable and inclusive presence of young people, ensuring adequate participation of young women, as well as young people from rural and urban environments, from different socioeconomic backgrounds, youth of African descent, indigenous youth, disabled youth, LGBTI youth, as well as refugees, displaced persons and stateless persons. You can also download a PDF version of the information available on this page HERE.